It takes you hours to change the credentials of a single employee. We can make the same changes in 4 seconds with JumpCloud. Introducing JumpCloud, your Directory-as-a-Service. With all the perks of an AD or LDAP server, it manages all your infrastructure, including the cloud, and all devices (even your employee’s!) with an easy-to-use interface. If you are looking for an easy way to securely manage your infrastructure, the buck stops here, starting at just $10 per month. User access is a thorn in the side of any administrator. Growth means more users, which means more user creation, more unique privileges, more work setting up the user on every part of the infrastructure and network. You hire someone, and you have to add a new user, with specific access privileges, on each server. You promote someone, the same thing occurs. Someone is fired, you need to go remove their credentials from everywhere. It’s a slow and painful process. The solution so far has been to create a single user for the group, with a username something like “admin” and a password something like “password123”. Overall, any given company’s infrastructure has lots of different users that require different access privileges. Managing those users can be more than just a hassle. Shared credentials are a security risk but often seem like the only easy or efficient way to go. Fortunately, Fibernet now offers the perfect solution: JumpCloud. JumpCloud is your Directory-as-a-Service in the cloud. It allows you to control users and access privileges from a single point, for all your infrastructure. You can easily add new, remove old, change and edit privileges, and integrate many other products and services into your infrastructure. You can easily map your directory, and secure it with multi-factor authentication. Create group access, with unique credentials for each user. Making personnel changes? JumpCloud makes it a cinch to manage all users, and their privileges. The core of JumpCloud is directory management, meaning a database that maps users to all parts of the infrastructure and areas of the network. It’s secure and easily integrates with your infrastructure. You can finally get rid of the admin account — users can now easily have their own login credentials for every part of your system. Users can be imported from anywhere, and easily maintained all in one place. Different systems can hurt the efficiency of any company, and lessen the control allowed to administrators. 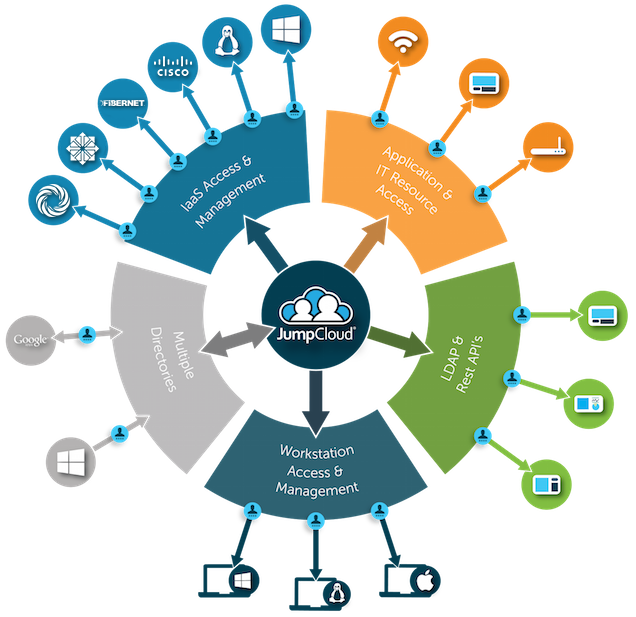 Now, it doesn’t matter if you use Windows, Mac, or Linux, all access can be centrally controlled and maintained through JumpCloud. JumpCloud offers an easy-to-use interface that allows administrators to create and edit user access. Each user can now have their own individual credentials, while still maintaining the ease of grouping control of resources. Now you can offer a single sign-on service for your users, by using simply one centralized identity. All internal applications can be accessed with a single authentication point. It’s secure, yet so much easier than continuously logging in to every application necessary. To increase the security, and ensure user login information isn’t abused, multi-factor authentication is available and customizable. Whether you use a token that generates a random number sequence, or a passcode sent to a user’s phone, you can ensure the security of each user’s login. More and more, businesses are using cloud-based applications for content creation and management, email. And so much more. JumpCloud offers integration to Microsoft Office 365, Google G Suite, LDAP, and many others.